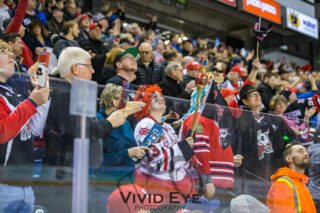 The Niagara IceDogs were back on home ice for Game 2 in front of a sold out Meridian Centre crowd for a matinee Sunday game against the Oshawa Generals. 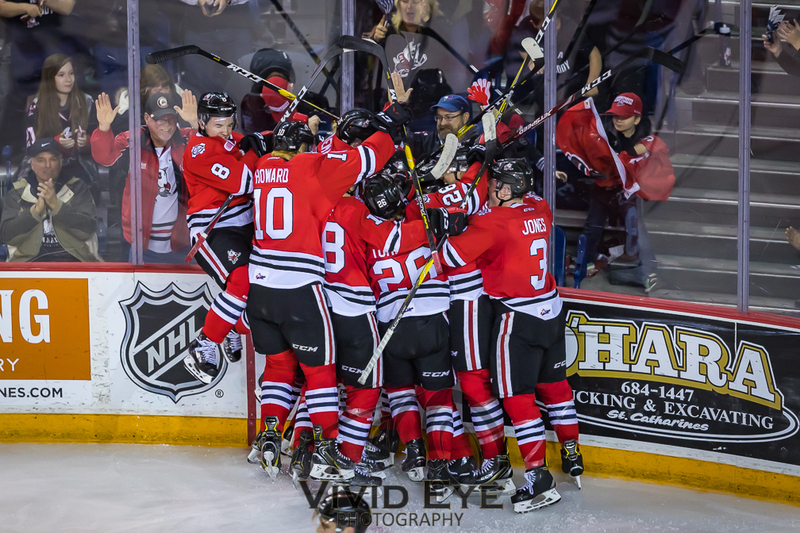 After take Game 1 in a thrilling overtime period, the IceDogs were looking to carry the momentum into their final game on home ice before heading to Oshawa for games 3 & 4. The IceDogs came out flying in the opening twenty, outshooting the Generals 21-8. Early in the period, the Generals took a penalty deep in their own zone. The ‘Dogs only needed 9 seconds with the man advantage for Ivan Lodnia (#9) to capitalize. The Minnesota Wild prospect was set up by former General Jack Studnicka and Jason Robertson to give the IceDogs the 1-0 lead through the first period. The former Generals continue to lead the lead the way for the IceDogs into the second period. Five minutes into the second period, Oliver Castleman made a cross-ice pass to findMatt Brassard, whose trickling shot from the blueline beat the Generals netminder to double the Niagara lead to 2! 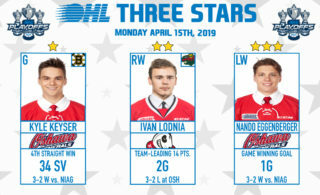 Ivan Lodnia was credited with the secondary assist, picking up his 5th point of the series. The Generals pulled themselves within one a few minutes after Brassard’s goal, but Philip Tomasino restored the 2-goal lead just over a minute. Tomasino’s speed was put on full showcase as he went blazing into the Generals zone on a 2 on 1. Tomasino wristed the puck over Keyser’s glove to give Niagara a 3-1 lead heading into the third period. Midway through the third period, Jason Robertson scored to extend the ‘Dogs lead to 3! Robertson’s goal was scored during 4 on 4 hockey, Robertson’s tally from the slot was assisted by Jack Studnicka and Jacob Paquette. The IceDogs reached the 40 point plateau once again in this one, continuing to come in waves onto the Generals defence. With just over 4 minutes to play in the period, the IceDogs were assessed a penalty. The Generals pulled their goalie for a 2-man advantage. 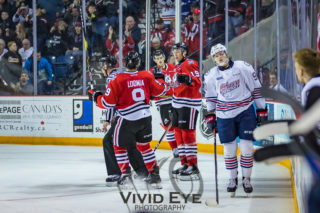 The IceDogs killed off the entire penalty, while Oshawa’s net remained empty. Jason Robertson fought off a General to a loose puck and scored into the empty net to ice the 5-1 win for the IceDogs! Niagara is heading into Oshawa with a convincing 2-0 series lead! We’re headed to Oshawa for Games 3 and 4 and you can too! 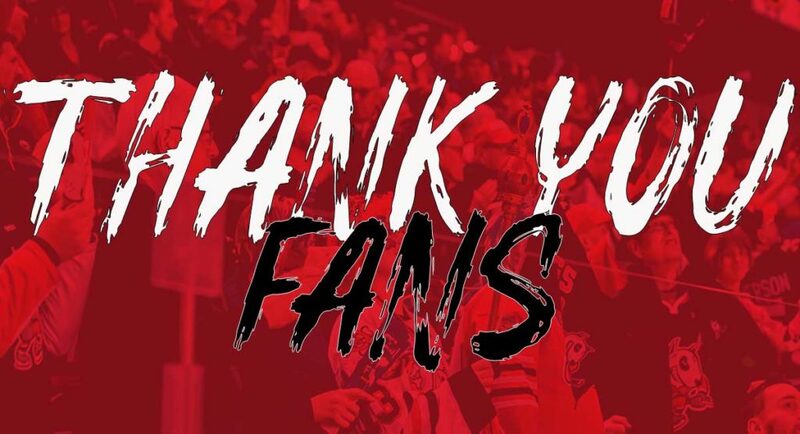 IceDogs Fan buses are back and we’re getting going to Oshawa to cheer on our ‘Dogs!